Posted on Fri, Apr 6, 2012 : 5 a.m.
John Cleese, an English actor particularly well known for "Monty Python" (which was written by the six actors, including Cleese) and "Fawlty Towers" (which he wrote with his then wife, Connie Booth), said, "I tend to have an odd split in my mind: I tend to look at it as a writer and when the writing thing is OK and I'm happy with it, then I put on my actor's hat." In today's deal, "split" is the key word. How should South plan the play in four hearts after West begins with three rounds of spades? South opened with a weak two-bid, showing a decent suit and 6 to 10 high-card points. 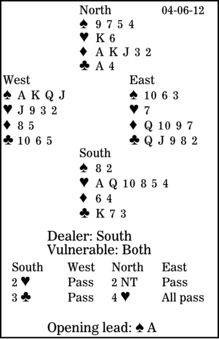 South's three-club rebid announced a maximum with a "feature" in clubs, usually the ace or king, but perhaps only the queen in a pinch. The contract looks easy, declarer apparently having 10 top tricks: six hearts, two diamonds and two clubs. However, if he immediately tries to draw trumps, he goes down when the split is bad. Instead, after playing a heart to dummy's king, South should cash the club ace, lead a club to his king, and trump his last club in the dummy. He cashes the top diamonds, ruffs a spade to return to his hand, and plays trumps. A ruff in the shorter trump hand is almost always the right play.